This month we’d like to introduce you to Paige Roberts. A native to both Endicott and Vestal, Paige graduated from Vestal High School, attended Boces for Auto Body and went to BCC for Early Childhood Education, a curriculum which will aid her in her future career goals. Many of the things she loved doing as a kid have stayed with her through the years, like her appreciation for exploring the outdoors. You’ll still find her hiking with her dog and kayaking to catch the reflections off the water. And in the last 3 years, she has visited 44 states and doesn’t plan on stopping there. 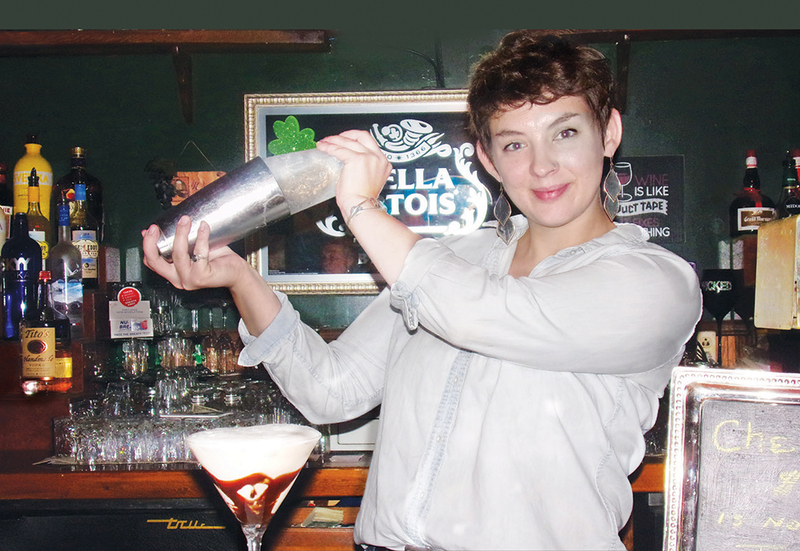 If you come to see her at The Wine Cellar you’re in for a great time sharing stories and telling jokes besides enjoying one of the great cocktails that Paige likes to make – the Chocolate Drizzle Martini. When asked about her future career goals Paige would like to be a self-sustainable farmer, fostering older children and running a small daycare from home. That’s a career path that makes us at MY TOWN want to stand up and applaud. Thanks, Paige for helping make this a great place to live!! Pour ingredients into a shaker and shake! Drizzle chocolate syrup into a martini glass. Pour ingredients into the martini glass and enjoy!